This elegantly appointed 4 bed + den, 5 full bath residence is a valuable purchase in desirable Country Club Shores. 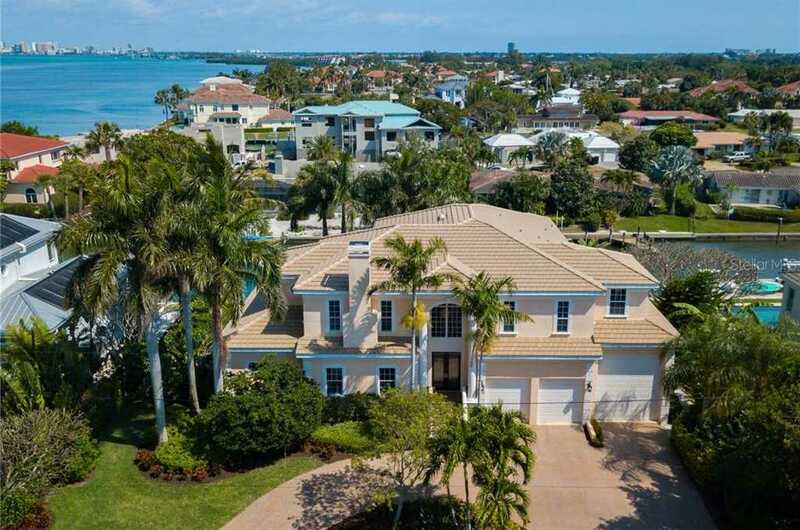 Ideally positioned only 2 lots from Sarasota Bay and boasting 120 feet of shoreline, this home is the ideal property for any boating aficionado. The floor plan was thoughtfully designed to accentuate the turquoise waters from multiple vantage points throughout. Tastefully appointed with travertine tile on the ground level, voluminous ceilings, impact windows, an office/library, and a huge great room. Walk out to your pool patio, which offers ideal southern exposure, infinity edge pool and spa, outdoor grill area, and stunning views. The composite dock with lift can house a yacht or sailboat; there is even a nice gathering area and extra room to place jet skis. The Kitchen, open to the family room, is appointed with gas cooktop, warming oven, wine fridge, and Sub-Zero refrigerator. The enormous garage has ample room for 3 cars, an RV, or large boat. The elevator will take you from the garage to the second level. The master bedroom is truly one to be desired with eastern Bay views, a private balcony overlooking the pool, tray ceilings and large walk-in closet. The bonus room, which is open to the downstairs, can be easily converted into a fifth bedroom or enjoyed as a game room with wet bar and closet laundry. Country Club Shores is known for its easy access to the bay, deeded beach access, and proximity to renown Longboat Key Club, St. Armands Circle & Downtown – the epitome of paradise! Amenities Additional Fees: Fees include Beach Access. Please, send me more information on this property: MLS# A4433190 – $2,850,000 – 560 Hornblower Ln, Longboat Key, FL 34228. I would like to schedule a showing appointment for this property: MLS# A4433190 – $2,850,000 – 560 Hornblower Ln, Longboat Key, FL 34228.